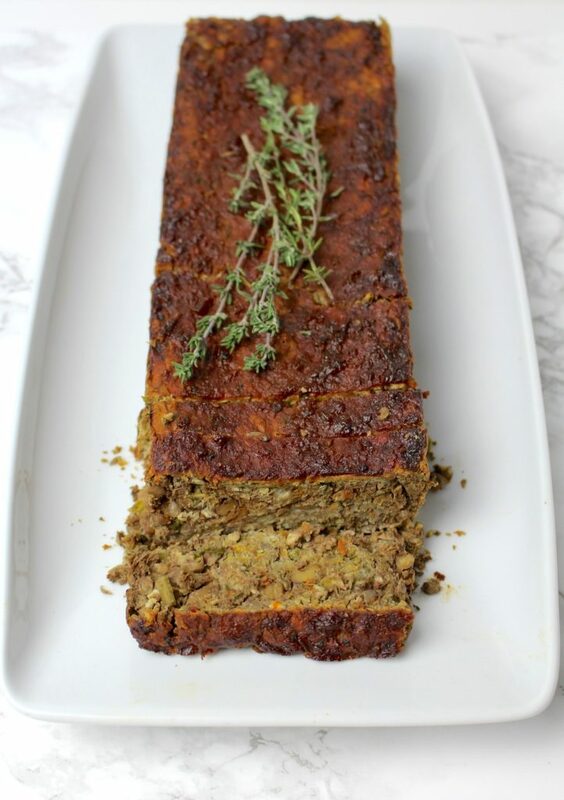 This vegan lentil loaf is perfect for any festive occasion, like Thanksgiving or Christmas. It’s hearty, filling and super delicious glazed with this BBQ sauce. Serve with mashed potatoes, vegan gravy and steamed/ glazed vegetables. 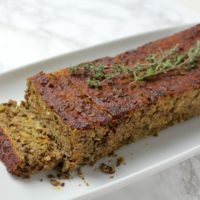 Feel free to add whichever spices and herbs you have and like – this lentil loaf is very versatile. 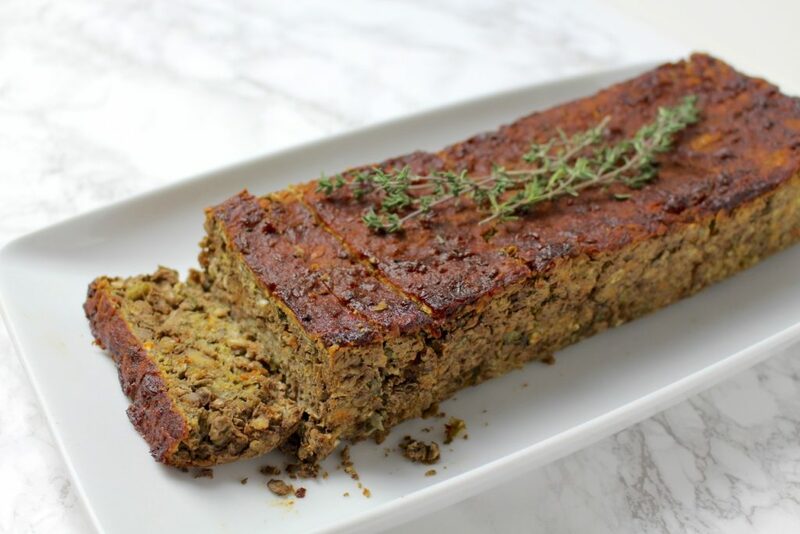 This vegan lentil loaf is perfect for any festive occasion, like Thanksgiving or Christmas. It's hearty, filling and super delicious glazed with this BBQ sauce. Serve with mashed potatoes, vegan gravy and steamed/ glazed vegetables. Prepare lentils according to instructions on the packaging (usually: add lentils to a pot with 3 3/4 cups water, bring to a boil and let simmer for about 40-45 minutes until tender). Combine flaxseed meal with 6 tbsp of water and let rest for a few minutes to thicken. Sauté onion and garlic in a pan (with some oil or water). After about a minute, add celery and carrot and saute for another 3-4 minutes. Heat a pan over medium heat. Add walnuts to the hot, dry pan, stirring occasionally, and cook until they start to brown and smell toasted. Transfer to a plate to cool. Once cool enough to handle, crush walnuts in a food processor, or by hand or roughly chop with a knife. Set 1/4 of the cooked lentils aside. Mash the remaining 3/4 of the lentils with a potato mash or a fork. Add sautéed vegetables, oats, flaxseed-mixture, herbs and spices to mashed lentils and mix to combine. Finally fold in parsley, walnuts and lentils. Taste, adding more spices or herbs to taste. Place mixture into a loaf pan lined with parchment paper and press down firmly. Spread BBQ sauce over top of the loaf and bake for about 50-60 minutes at 400° F (200° C). Once done, take out of the oven and let cool before slicing. 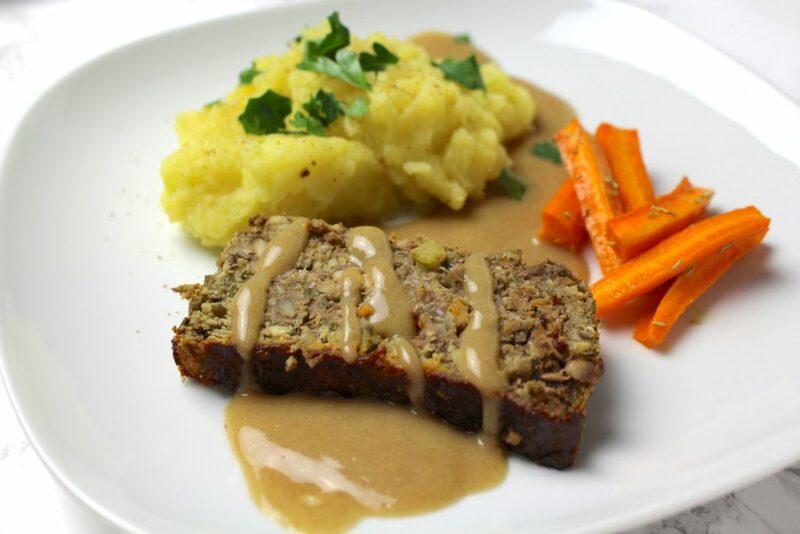 You can prepare this lentil loaf the night before serving. Keep in the fridge overnight and right before serving I recommend reheating individual slices. I hope you love this recipe – please let me know in the comment section below! If you make this lentil loaf, make sure to take a photo and share it on my Facebook page or on Instagram, using the hashtag #minamadefood. Oh and don’t forget to tag me (@thisisminamade) so that I can see your creations!